Yesterday I mentioned I was asked to speak with Find Your Influence at the last Arizona Blogger Meetup all about monetizing your blog/social influence from the perspective of a blogger. I was flattered, I loved speaking, and I was so humbled by how many people let me know how informative this meetup was! I think this is one many people know about. Sidebar advertising has been around a long time, and those Google Ads on the side are something most bloggers put up at the first sign of traffic. This is one situation where more page views equals a larger payout, so most bloggers with large following are those making a killing off this. However, even if small you can still make some cash! Similarly, many make money selling sidebar space to advertisers. This ranges from other bloggers to large retailers who want a little real estate. This is a bit of a dying field, but I still know a few girls who make a killing off it, so I won’t discount it! Advertising on websites/blogs has taken a few twists with creative integration in the past few years as feed readers and email subscriptions have taken over traditional pageviews. This includes the integration of ads in posts, at the bottom of posts, and more targeted ads on sidebars for traffic that still visits via pageview. Feel free to look outside of Google, getting in with an ad network can be a great thing, and there are many ad hosting companies out there always looking for bloggers! If you have space and you want to share a little bit one way or another, advertising is still a great revenue option for you. This is something that has exploded in the past few years and continues to grow each year! If you’re a fashion blogger in particular, listen up, this is for you! Any time you mention a product on your site and help readers gain intro to a brand/product you can make a little cash off that referral. There’s several ways to do this. I personally love ShareaSale for making a % off any sales that take place through my link, as well as Amazon Affiliates. Amazon adds a cookie to the browser and if the user buys within 20 days you still make a commission, it’s great! Reward Style is another one most bloggers who make it big utilize. I also love ShopSense because almost everything is on there and you get paid per click. Like if I told you today I wish I was wearing this dress, and you click that link, a few cents head my way. For most bloggers it isn’t enough to pay the bills, but it may buy them lunch or a few caffeinated beverages to burn the midnight oil. For a few, particularly in fashion, they are making a killing off this, read this CNN article for more! A million a year is no joke! I’m shocked how I’ve made a little here and there and just barely started using these. I really should have jumped in sooner, and thanks to readers who click those links! And thanks to bloggers who do help influence my shopping, deal finding, and product buying by offering these links. This one is kind of like a cheater item, because the money isn’t exactly made blogging, but the blog/influencing publicity is capitalized to sell a good or service. We’re talking eBooks, published books, photo styling, fashion styling, personal shopping, photography, clothing lines, handmade goods, consulting of any kind, etc. Think about it, if you write a blog all about personal finances, why wouldn’t you write a book about getting your finances in order? If you’re an expert in your field, and your blog is viewed that way, you should hustle the system and find a way to turn it into revenue! I should also mention that blogging itself is considered an expertise, and it’s one many companies need. Many of my friends make a solid income as contributors for online magazines, other companies getting into blogging, or even larger blogs. Some also make money running the social media for smaller companies that need the expertise. I even know a few people who work as a digital assistant to bloggers who don’t have time to do it all themselves- scheduling posts, helping with photos, running social media- you name it! All these skills are marketable, and any job you get because you have blogging/social media savvy abilities on your resume counts! 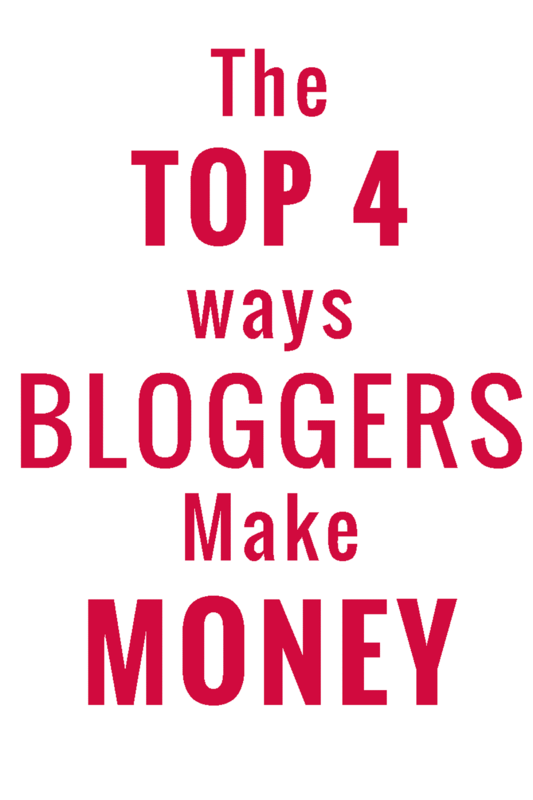 This is a personal favorite of mine and how I bring in most of my blogging income. Essentially most brands have had to evolve with generational norms and find where their target markets actually are. In less business lingo- brands know that radio and TV commercials that may have worked in the past, really aren’t doing much for sales these days. The Millennial generation is a generation of smart consumers who want a recommendation by at least three people before buying anything. They look to consumer reviews, expert advice, friends, and influencers who they see as experts, instead of well placed magazine ads and celebrity endorsements. Essentially, a fashion blogger with thousands of followers has more power to help people learn about a new fashion line than most expensive traditional advertising. Brands are realizing one influencer pinning their product on Pinterest can help it sell out faster than a multi-million dollar ad in Time’s Square. Consequently, they are putting more and more money into influencer marketing every year. How does it work? A contract is formed between either a public relations/marketing agency who works with a brand, or a brand marketing outreach person and the blogger. They agree to the work that will be provided by the blogger, the publication date, the keywords, the amount of pictures, the theme of the post, and what social media channels will be used. The amount you make will vary greatly depending on numbers, in this case most do want a bigger following and more exposure, but there’s still room for niche blogs and those with engagement, so don’t get discouraged! Once the agreement is made and the contract signed, the influencer does the work and within 30-60 days is paid the set amount. So how do you get hooked up with these brands? For many the answer is just apply to a known influencer marketing company, and they’ll walk you through how to get started. Most have minimum requirements to get accepted- number of followers on most social media platforms, pageviews monthly, and unique visitors. If you’re brand new to the game you may want to spend a little time and money growing your blog readership and traffic, but once you are seeing about 10,000 pageviews a month and have at least 1,000 followers across most your platforms, you can definitely start applying and some networks looking for smaller bloggers/influencers will gladly take you! If you get rejected don’t give up, you can always reapply until the blessed day comes that you’re accepted. Here’s a list of a few of my favorite places, the first four are definitely down with smaller bloggers and each work a little different, but are worth looking into and applying for! There are literally hundreds of these companies with more popping up all the time as influencer marketing is growing rapidly, so feel free to Google search and stalk the disclaimers of bloggers you admire. And speaking of disclaimers, I should mention you’re legally obligated to mention when you’re working on a sponsored post, or when affiliate links are being used in both blogging and in social media posts, so be sure to keep it legal! One more thing, most of these do involve a numbers game. The bigger you get, the more you can make. The more you do this, the more opportunities come your way. And I have to add, those who continue to rock at this know how to do it well. They know not to work with brands that they wouldn’t personally use or recommend. They know to only team up with companies and products that match their blog audience, and they know how to integrate the content naturally. Too much can always turn off readers and lead to eventually losing them. Make sure you’re careful and only work with companies you think really match your blog’s brand and aesthetic. Anything else I missed? Any questions you have? Feel free to leave in the comments below! Ok, so do you live in Arizona? I am looking at connecting with Arizona bloggers, but I'm up in Flagstaff, I would love to know more about that meet up. These are great tips! Personally I prefer offering sponsorships but I know a lot of people that make a ton on sponsored posts…I just always feel weird doing them! I love these tips! I have been blogging for almost five years but had never really thought about making any money off it until recently. It was great to get some information straight from another blogger! these are ridiculously helpful. i'm a newbie… kinda. i've been blogging since the early 2000s but never consistently and while i'm not really looking towards monetization immediately, this is definitely something to file away for the future.